Peshawar, Dec 3: At least nine suspects were arrested during a pre-dawn search operation here on Saturday as police launched an investigation into a terror attack on the Agricultural Training Institute (ATI) here that claimed nine lives. The anti-terrorism department closed the institute for an indefinite period and registered a case. The first information report included sections related to murder, terrorism and the possession of explosives, the Express news reported. 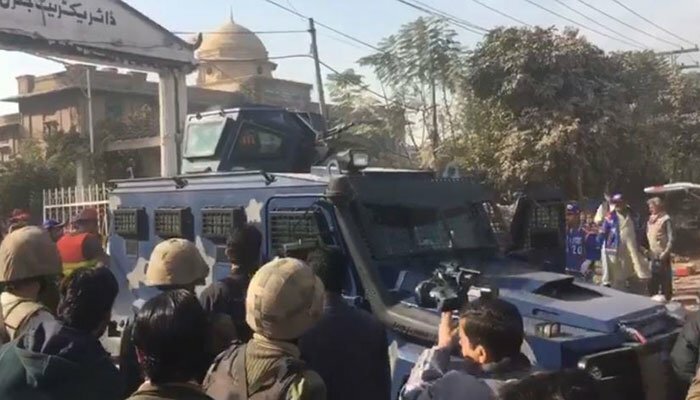 A large number of police and other security forces took part in the raids conducted early Saturday in Badhber, Telaband and other areas outside the provincial capital, according to police sources. Various types of arms were recovered from the arrested suspects including three pistols, 8mm rifles, 12-bore rifles, sub-machine guns (SMG) and a large quantity of ammos. Security forces searched at least 45 houses during the operation. The ATI released a list of eight students and staff member who lost their lives in the attack. They were identified as: Bilal Ahmad, Amin Jan, Sarzamin, Muhammad Wasim, Abdus Sadiq, Qasim Ali Shah, Bilal Khairul Bashar, Bilal Mohammad Arif and Malik Abdul Waheed. Most of the slain students belonged to far-flung areas of Khyber Pakhtunkhwa and Fata and remained in the hostel despite it being a holiday on Friday. The province mourned the deaths of the students and staff member, as the slain victims were laid to rest, Dawn online reported. At least nine people were killed on Friday when three militants attacked the institute. The dead include six students, a security guard and two civilians. Thirty-seven people -- among them a police sub-inspector and two soldiers -- were also wounded in the assault claimed by the Tehreek-e-Taliban Pakistan (TTP). Both police and military officials said the attackers had been coordinating with handlers based in Afghanistan. The bodies of the militants still languish in the mortuary. DNA samples from their bodies have been collected for their identification. The US also condemned the attack and offered its deepest condolences to the families of the victims. "We stand with the people and the government of Pakistan, and we will continue to work with our partners in Pakistan and across the region to combat the threat of terrorism," said a statement issued by the US Embassy in Pakistan.